Google announced that there will be 20 new cameras in 2017 that will be certified for compatibility with Google Street View. 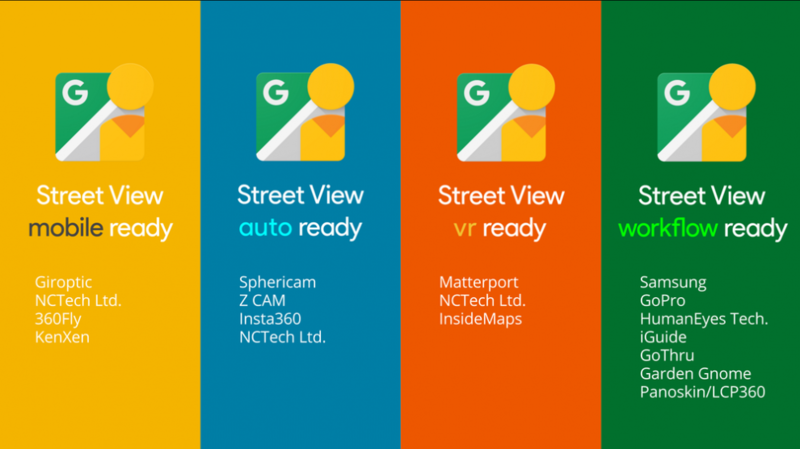 Google announced a new Street View certification program, and also announced that there would be 20 cameras “released over the coming months” in 2017 that would be certified under the program. 1. Mobile ready – can upload to Street View directly from their mobile app without needing a desktop. 3. VR ready – these cameras take not only photos but also “geometry” and can generate connected photos. 4. Workflow ready – tools (with or without cameras) that can publish to Street View. – Giroptic: mobile ready. This is interesting because the iO does not meet the minimum resolution for GSV. I don’t know if this means the Giroptic 360Cam would be certified retroactively, or if Giroptic has a new 360 camera to be announced. – 360Fly: mobile ready. Another interesting mention. Does 360Fly have a new camera to be announced? – Insta360: auto ready. I am supposing this is referring to the Insta360 Pro, but who knows, it could also be the Insta360 Nano 2. – Samsung: workflow ready. The 2017 Gear 360 doesn’t seem to connect to the GSV app right now. Perhaps this certification means the software will be updated to add uploads to GSV. – GoPro: workflow ready. I suppose this is referring to software for the GoPro Fusion, but it could also mean software for the GoPro Omni rig. – Humaneyes: workflow ready. Humaneyes is the maker of the Vuze 3D 360 Camera. Does this mean that GSV will soon support 3D 360 photos? The other interesting note is that the Google announcement said there would be 20 cameras, but only 18 names were mentioned, and some of them, such as Garden Gnome, are known to be software companies. This implies that some of the companies will be releasing more than one camera. Thank you very much to Upton North and Roman Goldman for bringing this to my attention! Do you’ll create a post category around GSV, posts about upgrades of GSV and about compatibles cameras with the GSV plan for pro to publish inner views in Gmap? Salut Julien! I will create a page for Google Streetview users. Please stay tuned!